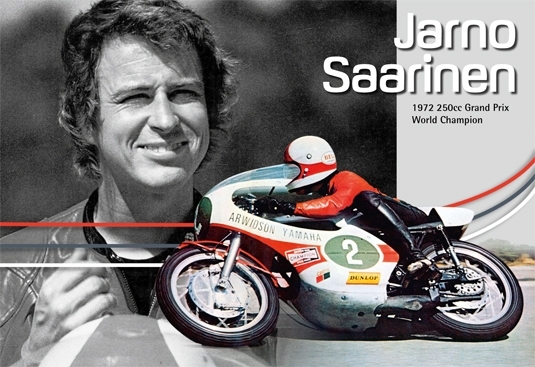 An exceptionally talented and precise motorcycle racer, Jarno Saarinen sat at the birth of Yamahas prominence in the premier class of Grand Prix road racing. The 'Flying Finn' - 39 years after his 250cc world championship success with Yamaha still marks him as the sole title winner from his country  sadly fills one of the tragic chapters in Yamahas competitive history as his untimely death at 27 years of age at Monza ended what was a bright new dawn for the rider, company and motorcycle racing on the whole. A qualified mechanical engineer, Saarinens passion for racing turned his head away from studies even though a methodical consideration of his profession led to an alternative and more angled riding style and a reputation as a forward-thinking competitor. Saarinen was the new star of the middle capacity categories and came into the Yamaha Factory Team after using TR3 and TD2 and 3 machinery to place 2nd and 3rd in the 1971 350 and 250cc GP series respectively. In 1972 he obliterated his rivals with nine podiums to grasp the 250cc crown and was the natural candidate to front Yamahas exciting venture into the 500cc division with the OW20; better known as the first ever YZR500. This potent four cylinder two-stroke technology caused ripples through the racing world as Saarinen won by a comfortable margin on his debut at the fast Paul Ricard circuit for the French Grand Prix. He was also triumphant in Austria for round two while at the same time still finding the chance to claim the opening three races of the 250cc competition on the OW17. The next event was the fateful meeting in Italy and Yamaha withdrew from the rest of the campaign as a mark of respect to the loss of their racing jewel. Only 46 Grands Prix and three seasons yielded 32 podiums, and one title could have been many more. Giacomo Agostini would eventually provide Yamaha with their maiden 500cc championship in 1975 but it could easily have come two years earlier. Jarno Saarinen was inducted into the MotoGP Hall of Fame in 2009.